The bright green Bermuda grass fairway on Shawnee Country Club’s second hole contrasts nicely with the darker green rough. When the high summer temperatures hit with a vengeance this past week, the Bermuda grass fairways at Shawnee Country Club near Milford went just a bit nuts. You can almost hear the grass growing as it soaked up the hot sun that’s been all too rare this past spring. As usual, during the winter Shawnee’s fairways were brown, as the Bermuda lay dormant. It usually takes at least a week or so of very warm weather to turn them back to green, and the rainy cold spring slowed down the process considerably, according to Shawnee course superintendent Steve Zeveney. “The turf was about a month and a half behind normal, but I’d say there’s been a couple hundred percent improvement in just the past week,” Zeveney said. Shawnee sprigged its fairways with Bermuda seedlings several years ago, and the conversion from the old fairway turf has mostly been successful. The combination of last summer’s drought and the snowy winter didn’t help matters, however. 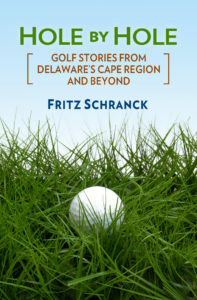 As with other Cape Region courses, Shawnee was forced to make a trade-off when it came to choosing the grass for its golf course. The mid-Atlantic region of the United States is in a transition zone. That’s not a reference to the cultural differences between the North and the South–it’s agronomic. 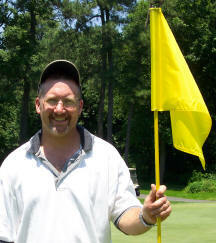 For example, in New York State, a “cool/humid” zone, the best golf turf is usually a form of bentgrass or bluegrass. In Florida, a “warm/humid” zone, the best golf turf is usually a Bermuda grass hybrid. In transition zones like Delaware, however, it’s just warm enough to bother the northern turfgrasses in the summer, and it’s just cold enough to bother the southern turfgrasses in the winter. Turf experts such as the USGA’s Green Section recognize that maintaining good turf year-round in the mid-Atlantic region is about as hard a job as anyone can ask a golf course superintendent to perform. This particular hybrid is also recognized for being better suited to survive a harsh winter than other popular Bermuda hybrids such as Tifway or Tufcote. In fact, Shawnee is about the northernmost golf course in the transition zone that uses Bermuda grass, according to Zeveney. During the winter the Vamont turf provides another benefit. In February Zeveney and his crew are usually able to spray Round-up® directly on the fairways. The weed and grass killer eliminates poa annua and other weeds, without harming the dormant Bermuda. Unfortunately, this year’s snow eliminated that option. “Logistically, we just couldn’t get it done,” said Zeveney. As the turfgrass grows this summer, therefore, it will face a bit more competition. Here’s a playing tip about Shawnee’s Bermuda fairways. The ball sits up very nicely on the turf, but it doesn’t roll as far as on bentgrass. Players who aren’t used to the Bermuda often find themselves with a longer approach shot to the green than they expected. Some golfers can do much better using their three-woods than their drivers, because the ball will carry farther with the more-lofted club.